Dissolve honey in warm water in a small bowl then sprinkle yeast on the surface. Leave it to foam for approximately 10 minutes. In a medium bowl mix whole wheat flour, salt and herbs until well combined then add the yeast mixture & olive oil to the dry ingredients. Mix well then tip off mixture onto a liberally floured work surface. Knead for about 10 minutes. You may need to work in more flour gradually until the mixture does not stick to your fingers and the dough bounces back slightly when you press on it. As this crust is made of whole wheat flour, the dough will be heavier, denser and will not rise as much as compared all purpose/plain flour. After 1 hour, punch down the dough and remove the dough on to a floured working surface. Roll the dough into the shape that you desire. For a thin crust (as in the picture), roll it to about 0.2-0.3cm thickness and place it on to your baking/pizza tray. Leave it to proof for at least 15 minutes then pre-bake the crust at 250 degrees Celcius for 5 minutes before placing your pizza toppings. Place the garlic bulbs on an aluminum foil and drizzle olive oil on the bulbs then wrap with the foil. Roast in the oven for about 45 minutes. Take the garlic out of the oven (but leave the oven running at 220 degrees Celcius) and cut both bulbs in half. Squeeze the garlic out (it should be quite mushy) into a bowl. Add about 4 tablespoons of olive oil, Italian herbs, salt and freshly ground black pepper and mix well. Spread the garlic oil mixture on the pizza crust then arrange the beef bacon slices on top of it and drizzle a little of olive oil. Arrange the zucchini coins on top of the beef bacon slices, alternating the yellow and green if you are feeling fancy. Sprinkle some salt and ground black pepper and drizzle a little bit more olive oil on top. Finally, sprinkle the cheese and place the pizza into the oven for 15 to 20 minutes. Serve with a side of green salad. 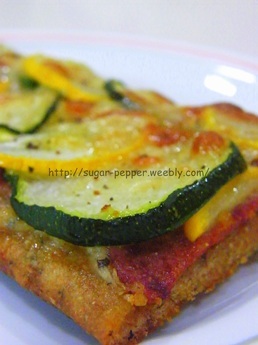 A healthier take on the usual sinful pizza takeouts. P/S : You could also use the garlic and oil mixture to make your own garlic bread! Just spread the mixture on your favorite bread or roll and toast it in the oven.